I love the purple accent this adds to my grey and white kitchen. Simple yet makes a statement. 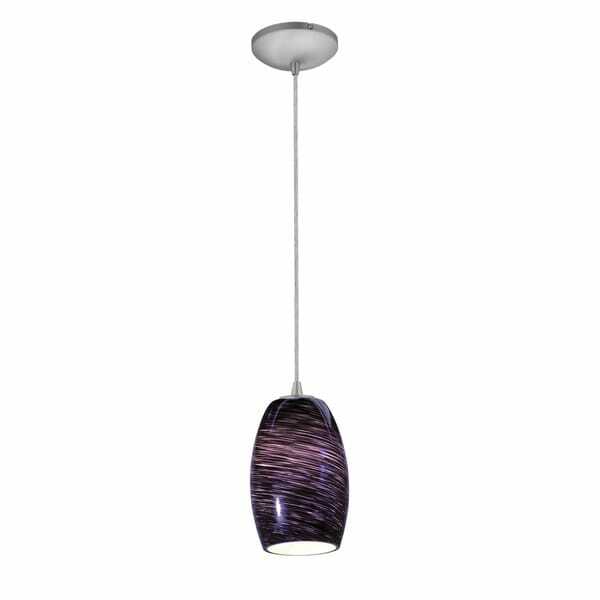 Even though they are a dark purple they provide plenty of light to be left an alone or with the overhead lights. Elongated dome shape offers a refined diffusion of downward light. Gently illuminated by incandescent or fluorescent lighting. This fixture gives off 1600 Lumens and has a temperature of 2700 Kelvins; has a max height of 152.25 inches, shade dimension are 7 inches high x 4.75 inches wide, and has a canopy dimension of 5.25 inches wide x 1.25 inches thick. Includes 12 feet of cord.